A few hints were dropped that there was still more to reveal about the special edition version of Sengoku Basara 4 and we've now got a beautiful preview of all of the bonus items on the e-Capcom website. There's also some news: Capcom have been collaborating with Production I.G. and Studio WIT in their work on Sengoku Basara 4 and there will apparently be some animated content incorporated in the game. Ookubo Tooru was the character designer for the Sengoku Basara anime series and he's handling all of the character design for Sengoku Basara 4 as well as the art direction. The brand new Sengoku Basara 4 characters were created by Ookubo instead of the series' usual designer Tsuchibayashi Makoto. Storyboarding and animation direction is credited to Sessha Gorou. Event scenes were storyboarded by Oohata Kouichi and production was handled by Anima. In addition, Yamamoto Mika worked with Ookubo on the alternate costume designs and anime director Araki Tetsurou assisted with planning the poses. Ookubo's designs will be included in the game's special edition book Sengoku Basara 4 Bushou Hiden No Sho (detailed below) along with creator interviews. The members of CLAMP - famous manga artists and self-confessed Sengoku Basara fans - have drawn Masamune, Mitsunari, Sakon and Katsuie for the book as well as their favourite characters. 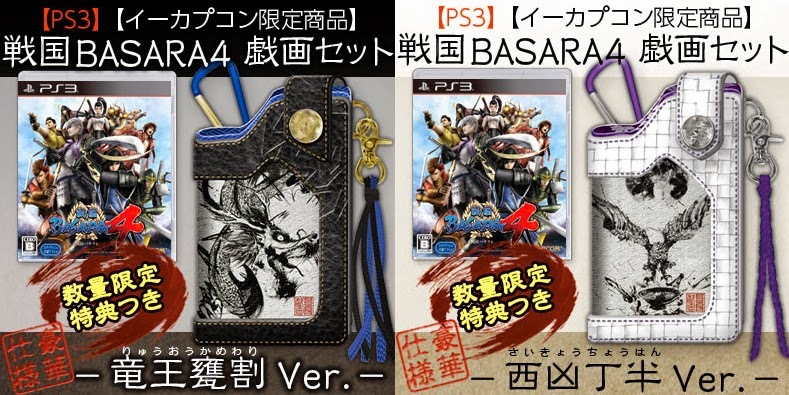 Just as promised, Capcom revealed their full range of Sengoku Basara 4 store-exclusive bonus items this morning, allowing buyers to make an informed decision about the best place to pick up their copy. The release date is 23rd January 2013. 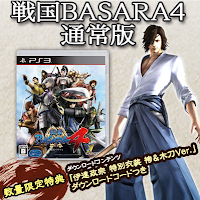 As this is going to get confusing otherwise, I'm going to recap every possible known way to buy the Japanese edition of Sengoku Basara 4 in this post even though I've covered it before. The newest information will be placed at the bottom of the list. If you need any help finding the best way to order please leave a comment and I'll try to assist! Firstly, there are two main versions of the game available for purchase, the standard edition and the Hyakka Ryouran Tamatebako special edition. I'll list the places I know which stock the item. The standard edition only contains the game. The first press includes a code for the special DLC costume for Date Masamune (hakama/wooden sword). As well as the game itself, this special edition contains a 100-page Sengoku Basara 4 storyboard collection, an 80-page hardcover A4 book about the commanders titled 'Sengoku Basara 4 Bushou Hiden No Sho', a special Masamune jacket (sleeve) for the game and a golden-coloured Masamune custom theme for your PS3, presented in a special box. The first press includes a code for the special DLC costume for Date Masamune (hakama/wooden sword). Next come the store exclusive bonuses. The store exclusive sets will include the same items listed above, including the DLC code for Date Masamune's special costume (hakama/wooden sword) if you order in time to receive the first press. The official e-Capcom store is selling two special versions of the game. 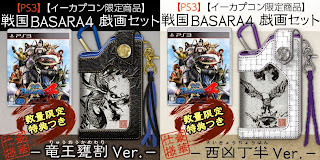 The Ryuuou-Kamewari edition comes with a black leather case based on Masamune and Katsuie while the Saikyou-Chouhan edition comes with a white leather case representing Mitsunari and Sakon. e-Capcom doesn't accept credit cards issued overseas so fortunately Play-Asia is able to obtain the Giga sets upon request. If Play-Asia stop accepting orders, foreign fans will need to use a deputy service. HMV Japan is run by Lawson, so this version is available in HMV stores and also through the special Loppi machines installed in convenience stores all over Japan. Fans who place their Sengoku Basara 4 order through HMV's website or the Loppi system before 17th January 2014 will be eligible to receive a special DLC code for Ii Naotora's wedding outfit and an exclusive Naotora jacket (sleeve) for the game. Unlike the other sleeves, this one has been drawn in the style of the anime. HMV ship worldwide and have an English-language version of their website. There are listings for both the standard edition and the Hyakka Ryouran Tamatebako limited edition. Please note that at this time only the Japanese-language listings show the exclusive Naotora DLC. I have contacted HMV asking them to confirm that they're shipping the exclusive DLC codes to foreign buyers as well, and I've been promised an answer once they've checked with their product specialist. Fans who place their Sengoku Basara 4 order through either Edion (limited edition) or Joushin Denki (limited edition) will receive a special DLC code for Ishida Mitsunari's 'DMC Vergil' outfit and an exclusive Mitsunari jacket (sleeve) for the game. Update: If you're having trouble ordering from Joushin Denki you can use their store on Rakuten's Global website (standard edition and limited edition). There's an option to use international forwarding if you can't have it shipped to your home address directly. Fans who place their Sengoku Basara 4 order through Game Tsutaya (limited edition), Bic Camera (limited edition), Sofmap (limited edition) or Kojima will receive a special DLC code for Shima Sakon's 'Twin Sword Kung Fu' outfit and an exclusive Sakon jacket (sleeve) for the game. Please note that this appears to be a reference to Bruce Lee's iconic Game Of Death costume. The Kill Bill costume a lot of people are thinking about is also a reference to Bruce Lee. Fans who place their Sengoku Basara 4 order through either Amazon Japan (limited edition) or Furuhon Ichiba will receive a special DLC code for Shibata Katsuie's 'Absolute Justice' Azai Nagamasa-themed outfit and an exclusive Katsuie jacket (sleeve) for the game. Fans who place their Sengoku Basara 4 order through Japanese entertainment chain GEO will receive a special DLC code for Sanada Yukimura's 'Azure Dragon' Date Masamune-themed outfit and an exclusive Yukimura jacket (sleeve) for the game. Note: GEO can be a little confusing but you can order through this website (you'll probably need to use a deputy service) to get either Yukimura with the standard edition or Yukimura with the Hyakka Ryouran Tamatebako special edition. 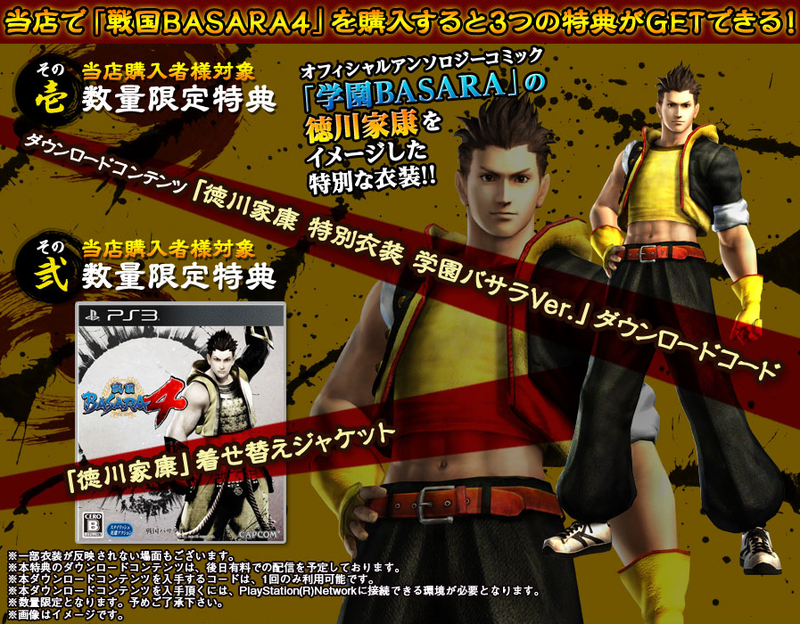 Lastly, fans who order through Yodobashi Camera (limited edition) or e-Capcom will receive a special DLC code for Tokugawa Ieyasu's Gakuen Basara school uniform and an exclusive Ieyasu jacket (sleeve) for the game. In the case of e-Capcom, this offer applies to all four versions they sell. 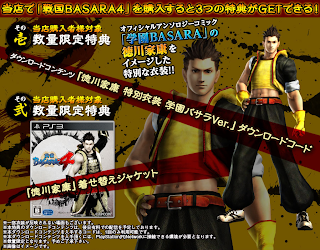 The shot of the jacket apparently confirms that Ieyasu's Basara-e artwork depicts a sun (and a tanuki beneath it!?). For those who aren't familiar with Gakuen Basara, it's an official Capcom manga anthology series which recently published its sixth volume. 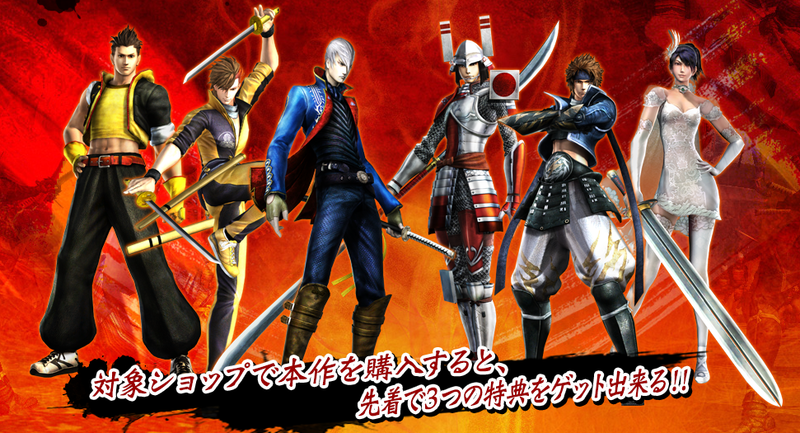 All of the Sengoku Basara characters are reimagined as disruptive students at a school run by Oda Nobunaga. The DLC codes apply to either version of the game (or all four in the case of e-Capcom), but quantities are limited to first-come, first-serve. There are plans to make the costume DLC available later on as a paid PSN download. HMV posted a promotional video showing the wedding dress in action. Press coverage has also appeared, with articles and pictures on Famitsu, Dengeki Online and 4Gamer. 4Gamer posted another article showing some of last week's new enemy formations as well. The fan club lottery for tickets begins tomorrow so there's a little more news about January's Basara Matsuri event to get people excited (even though it's going to sell out ridiculously quickly either way). Seiyuu guests Okiayu Ryoutarou (Toyotomi Hideyoshi) and Ikeda Shuuichi (Ashikaga Yoshiteru) will be joining the line-up! Game director Yamamoto Makoto has been answering questions on MyCapcom's Tokusei Kawaraban fan page and there's also a Sakon gameplay report. The pictures are very small and I didn't notice anything new; it uses the same TGS demo version of the game we've seen plenty of times already. YamamotoD's remarks include a discussion about the gambling theme of Sengoku Basara 4 which was his first solid idea when he was coming up with the game. The colours worn by Katsuie and Sakon are probably meant to recall the black/red of roulette along with Yoshiteru's twirling baton and general casino imagery (it's important to remember here that Katsuie is officially not coloured green but an iridescent hue which shines green in some kinds of light and black in others). MyCapcom requires a login. I described how to create one with a walkthrough in an earlier post. 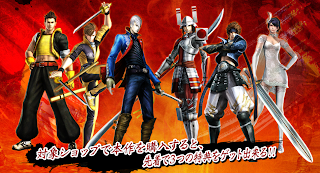 Update 24/10/2013 (10:00): Added the Basara Matsuri news, a video and the press links. So basically, if I order the Special Edition I won't be able to get the Yukimura DLC? You should be able to buy the Special Edition at GEO and receive the DLC code/sleeve. Alternatively you can wait for the DLC outfit to go up on PSN and buy it with Japanese PSN credit later (but you'll miss out on the special Yukimura sleeve). Yukimura's is a bit annoying as GEO is relatively difficult to use compared to the other shops. You can ask a deputy service to buy the LE here at one of GEO's distribution chains to get both the physical items and Yukimura. Thanks for the news ! I ordered Hyakka Ryouran Tamatebako special edition and I'm happy to see all the bonus explainned. I will buy the costume for yukimura later on the psn, that is my favorite beside Masamune. I like the Nagamasa costume of Katsui but its look like a trap.... No more Nagamasa then? Cant wait for the next wave of character! I'm glad it was helpful! The Hyakka Ryouran Tamatebako looks so good now there are pictures (of course, it looked good before too...). These DLCs look really pretty but... Capcom looks like it is really needing money to only have make only one DLC downloadable for game lol. By the way, what is supposed to be that sleeve? It is almost a 2nd costum which you can put on the selected character...? Thank you for your comment! 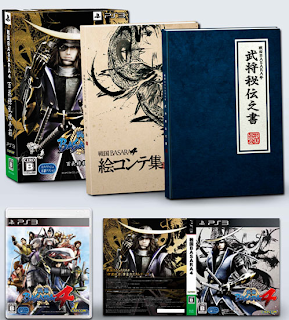 The sleeve is (I think) just the paper cover in the game case, so it lets you turn your copy of Sengoku Basara 4 into a special 'Sengoku Basara 4: Ieyasu Edition', if that makes sense (or whichever character you choose). If you don't like the cover art or want to see your favourite character every time you look at the game box it's a nice little bonus. Oh, if my explanation was too confusing it's easier to tell if you look at the bottom right of this picture. You can see the full Date Masamune sleeve. Ah, I see~. That is pretty cool! I have been confused of what Capcom wanted to say with that sleeve thing ouo. Sorry for bother you with my doubt. Okay, now I'm really tempted to call in some favors in Japan so I can get the special edition ft. Yukimura without using a deputy service... That aside, I don't really get it. I mean, it's cool and the costume looks great, but he looks so out of character. ^^;; I guess that's the point, though. They should've given him an eyepatch, too, for good measure. (And they should make a reverse one with Masamune, too, so they can both be out of character...) But oh well, it's exclusive Yukimura content, who am I to question it. If he does return in 4 (outside of cutscenes), I'd love to see him have the option of a Katsuie costume too. Though they're both so slender and stiff that I'd end up getting confused all the time when playing with my friends. I stayed up so late yesterday because of all the news! The character site for aniki and others opened but everyone seemed to have forgotten about them (lol). Do any of these other stores offer overseas shipping? I mean appreciate the original illustration jacket but the coloring looks kind of unfinished(?) to me... For HMV I contacted them about the HMV preorder bonus around late September and I remember getting a response saying that my order will come "with novelty". But I'm not even sure if they understood me properly.. I had to email HMV three separate times before they understood me properly and went away to confirm, and now I'm still waiting for their final agreement that the bonus items will be sent overseas. I'm sure it will be fine but it's annoying not knowing for sure! I'm keeping my HMV preorder (I love Naotora's outfit and the anime-style sleeve is neat) but for various reasons I might be purchasing a second copy of the game, so it's difficult to decide which I want most. So difficult that I haven't actually done anything yet or checked if I can buy from some of the stores ^^; but I have a few forwarding arrangements in place already so I should be ok. Since Play-Asia have listed the e-Capcom exclusive Giga Sets, I expect that they can act as a deputy service and buy any of the other versions if they're asked (I'm just guessing). They must be able to get the e-Capcom version at the very least. So that might be one solution if you're tempted by the bonus items. Or you can try buying from Rakuten Ichiba (Joshin and Medialand (GEO) sell there - the English version has some options for arranging shipping overseas and they definitely take foreign credit cards, so it might be possible to order one of the special versions that way. Thank you! I will definitely keep a look out for Mitsunari's version on Rakuten since GEO listed that the DLC for Yukimura's costume is included in the descriptions. I'm also tempted for Sakon's because his DLC looks so nice for some reason but I don't really know his character that well so I decided to hold off on that one. I'm going to hold off a little longer before I cancel my HMV preorder because I personally think that Capcom put the most effort on Naotora and Masamune's DLC and there MIGHT be a chance (although very very low) that other preorders might be announced since a lot of other major chain stores weren't included in the announcement (along with popular characters like Motonari or Motochika, which would make sense if they are announced in a second set along with other characters since Motonari wasn't even announced yet). I'm really hoping that they will announce casual/everyday and gakuen clothing for everyone! Well, time to get another Japanese PSN card. Ahh a second copy, I'm so jealous. I'm afraid if I go crazy spending money now I would feel guilty buying the other products later on. I'm expecting that they will sell a lot of things looking at the amount of fan services that they incorporated in the announcements. I'm desperately hoping for really nice look figures (especially Hanbee, please Capcom....). Some nice larger figures (like the G.E.M. series...) would be amazing since they've hardly done any. I fear they may be flooding us with small figures in January (Ichiban Kuji, Mame Sengoku Basara trading figures and the Ieyasu/Mitsunari One Coin Grande set) but if they all sell well in spite of this it should bode well. I'm glad it's mostly DLC (and alternate sleeves). If they'd had really good physical extras I might have bankrupted myself trying to collect things, whereas at least I know I can probably get all the DLC later on this way so I'm more relaxed. Yeah I wasn't a big fan of those revoltech or the kotobukiya lines. Mame and the nendos were adorable but they don't fill the gap in my heart ;_; Since the cute figures sell well Capcom will be either "we'll take risks since the smaller ones sold well" or "we'll just make more since they sell well". Probably the later knowing how much money Capcom needs recently. Capcom please release larger scaled figures. It can be expensive and limited because I will throw all the money I have at you no matter what. I agree, the CD jackets aren't worth spending a fortune on but I wish some stores sold all of them as a bundle like they did with Basara 2 a while back. God January 23rd seems so far off (+ the shipping days for the foreign fans ;_; but I heard that HMV sends stuff out before the release date so some people have gotten CDs on same day as Japan before)! Every time I hear more news I always re-watch the game plays and then I get hyped up all over again. But I'm happy that they are releasing leaks at a shorter interval rather than what they did with Basara 3. I'm not sure how well the Sengoku Basara-themed ball-jointed dolls sold, but I hope they aren't using those to gauge interest in more expensive figures as I found them a little scary-looking ^^; I'd spend a fortune collecting high quality PVC figures, though. The amount of news flowing from Capcom has definitely been satisfying this time around! The new promotion videos for the DLCs reminded me how much I love Mitsunari again and I ended up buying him with forwarding service orz. I told myself I would wait a bit but seeing how Edion sold out I got desperate ;;; By the way Joushin added their supplies on Rakuten and the DLC+jacket still comes with all orders. It seems like the suppliers reply x100 faster and much more concisely if I write in Japanese even if they say they support English. Seeing how much male figures were at AGF I'm desperately hoping for Basara figures. I would end up preordering without even thinking (so I hope they have intervals between the figures or I would go broke ;_;). I'm low on JP PSN credit so I should buy some more at some point. It's exciting how quickly the release date seems to be approaching now. Oh, and thanks for the note about Rakuten, I'll add the links to the post for the other Mitsunari fans! Thank you, Now it's just waiting anxiously for my package. I'm just hoping nothing goes wrong with my order; it would be a nightmare! Why is Basara such a niche series in the West? I'm always so jealous of Japanese people who can go out and buy merchs and go to events while I stay home and watch the DVDs (lol). I always believed that if I learned Japanese, Basara would become so much more accessible but now that I can it just seems more far away because I can learn about the events and exclusives that I can never go or get. Well, better save up money to import merchs after they come out next year (lol). I even bought the silly custom themes for Sengoku Basara 3 on PSN (my XMB has been Eastern Army themed ever since, so it will be nice to have a change with the new content!). This series is way too addictive. Oh really? Thank you for the good info. That would come in handy if I need to make an impulsive purchase (lol...I'm laughing now but it's true ;_;). OH MY GOD ARE YOU ME haha yeah that is basically what I do (except I bought the icon too...I'm going to blame myself for buying everything Capcom throws at me if they start selling even more sillier or lazy DLCs to make money). I tried to hook some of my friends and even family members but they either don't understand the whole concept so they don't know what's going on or they think its "decent" but they don't see what's so special about it (then I go off in my "a hundred million ways why Basara is the best thing that happened on Earth"). So yeah, no Basara fans around me. Basara is seriously ruining, actually no; it ruined my life (but I don't mind hahaha ;_; it's really surprising how long I've been obsessing over this franchise). There must be something that makes Basara so addictive because the majority of the fan base is pretty dedicated to game. I personally blame the lack of promotion CapcomUSA has done for Basara's "faliure" in the Western market (which I don't even think is a failure but Capcom was probably expecting almost as much as success they had in Japan). I'm actually really excited for the next reveal because with the new female character Capcom just threw everyone off. When KobaP said there was another girl character along with Naotora, no one believed him (lol). e-Capcom doesn't accept foreign credit cards? So will my order just be cancelled? If you've managed to actually place the order you should be fine. It used to reject my card during checkout! Wow, thanks for the very informative post! Just wondering, since Play-Asia is listing the E-Capcom special sets, will ordering those net me the Ieyasu costume and sleeve? Thank you so much for posting the sites, i just pre-ordered my Hyakka Ryouran Tamatebako special edition from amiami and now i can't wait for the next 70 days -__- , by any chance do you know what is the cheapest japanese psn card that i need to buy all the costumes (besides masamune's) ? Congrats on ordering the special edition! Does anyone know if these places sell or ship to Canada? Yesasia, Play-Asia, CD Japan, Ami Ami and HMV should all ship to Canada unless there are some odd restrictions I'm unaware of lately, and all of those also offer an English-language checkout. I'm not sure whether Canada uses the Global version of Yesasia or the US one, but one of the two links will work. If you have no preference, HMV are usually very quick since they ship with EMS straight from their Japanese warehouse, and there's also a chance you'll receive the DLC code for Ii Naotora's dress if you order from them (still waiting for them to confirm!). You might find a better deal elsewhere though depending on the exchange rates and shipping. I've bought from all of those stores and had no problems to date.